If you hadn't heard, I have a certain daughter that loves orange. She is crazy for it! 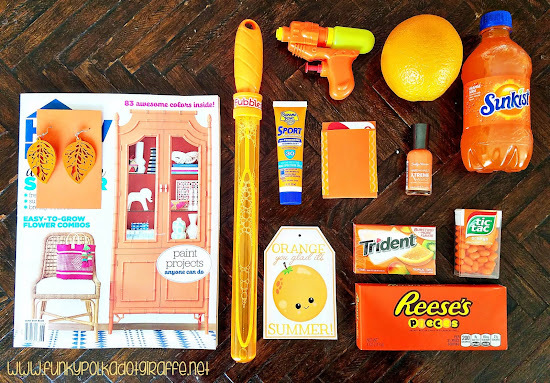 She wants her hair orange, she wants her clothes orange, she loves orange food best and everyday involves orange in one form or the other. So, when it was time to do end of the year teacher gifts I knew that orange would need to be involved in some way. 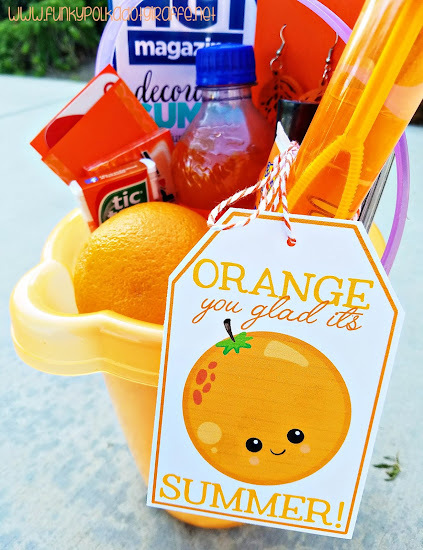 Since we had already done the Orange You Glad I'm Eight when she got baptized almost 2 years ago, I thought that Orange You Glad it's Summer would be the perfect theme for a teacher gift. 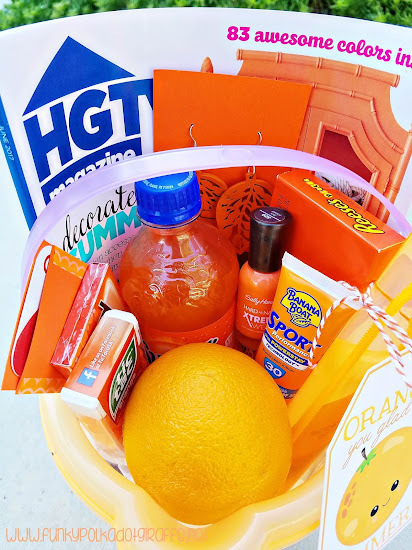 So I gathered up as many orange things as I could find and filled up a cute orange sand bucket that I found in the Dollar Spot at Target (or whatever they're calling it now) and loaded it up. I lucked out in finding the HGTV magazine with an orange armoire on the front that went perfectly with the orange theme. I bought cute wooden leaf earrings and sprayed painted them orange. They turned out so cute!! I also included a gift card and made an orange gift card holder for it with a scrap of scrapbook paper and some orange washi tape. It all fit in the bucket perfectly and then I added a cute little tag that I made by attaching it to the bucket with orange baker's twine. My daughter was thrilled with how it all came together. It was so much fun to make and I love that you can put anything in it you think that your teacher would love that is ORANGE! 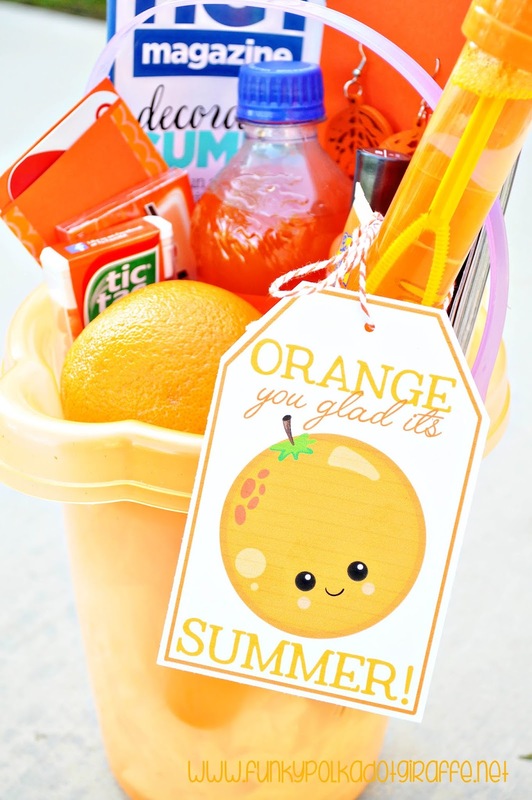 If you'd like to make one and use the free printable tag, you can download it HERE. Please do not remove the watermark. Love this idea. One week of school left to go...! 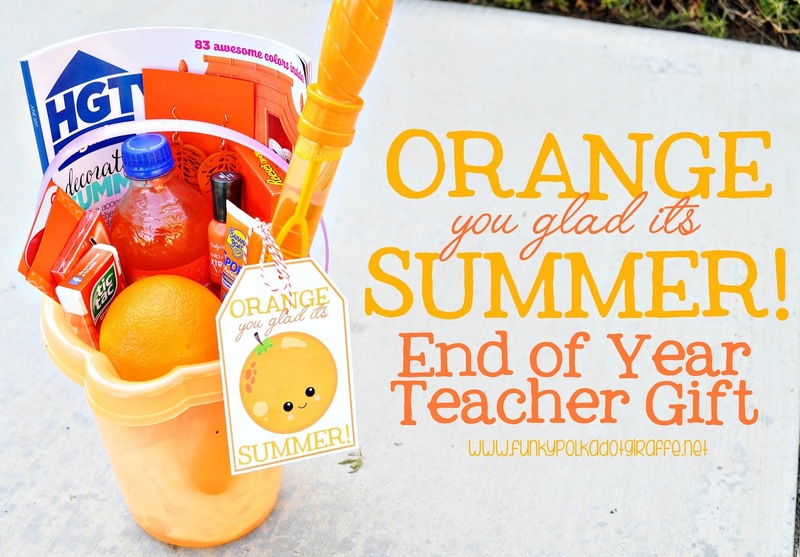 Would've forgot about sending an end of school year gift for the teacher until your post reminded me! Thank you!